A couple of weeks ago we had the pleasure of going over to see our friends at Camp Mont Shenandoah (CMS) for our annual pre-camp gathering of local camp directors. This information- and inspiration-sharing weekend was something my grandfather, S. Cooper Dawson Jr., (the first in our family to take over and own and operate Camp Alleghany for Girls beginning in the 1960s) started a very long time ago. At some point, that vibrant and helpful tradition died out, but about 5-6 years ago, Ann Warner of CMS and I decided to revive it. In the best of all possible worlds, we try to get together with all the camps near us, but of course everyone has different schedules for moving to their camps, starting staff training, etc, so we can’t really ever find a time that works for everyone. We just do our best, and usually a handful of camps can make it work. This year we had staff from ‘Ghany, Twin Creeks, and Hidden Meadows join the few staff members at Mont Shenandoah. The idea is to get together and take a tour of the hosting camp and enjoy dinner together, as one last break before the craziness of camp starts. A calm before the storm, if you will. CMS is a similar camp to ours — it’s all girls, almost 100 years old, has similar traditions and activities, the same length sessions (including a one week Mini Camp like ours that they call Roots & Shoots). CMS campers live in cabins, though, and they’re a much smaller camp (only holding 140 campers, to our 220 for Term Camp sessions). This year almost all of our Administrative Team was able to attend, as well as my oldest son Mason, and Office Manager Louise Dawson’s daughter. Mini Camp Director Beth Ann Clark-Thomas (BA) wasn’t able to attend since the first group of L.O.L. participants arrived at ‘Ghany the same night (see BA’s blog about L.O.L. Weekend from earlier this week). Our Facilities Director, Garrett O’Dell, was slated to attend but felt the pressure of the impending L.O.L. Weekend and didn’t want to get behind in preparations for that. But my parents (Director Sam Dawson and Special Events Director Bonnie Dawson), Louise, Program Director Casey Tucker, and I all got to go. Ann is always a gracious hostess — we started with some snacks on their beautiful deck overlooking the Cowpasture River. Then we set off for a tour through their beautifully landscaped and manicured grounds. Ann lives on the camp property year round, and you can really tell, as her grounds are just so well maintained all year long. Several of their cabins and buildings are original, and they are simply breathtakingly gorgeous — beautiful rustic old log cabins, a soaring stone fireplace, truly Americana style! After a tour, some more snacks and a group picture on the deck, we headed over to their Dining Hall, appropriately named Feed Bag, and had a delicious dinner prepared by their head chef. It was awesome to network and chat with professional camp friends who are right in the thick of it just like we are. No one else truly understands this job, or is better prepared to offer insight, ideas, commiseration, and support. In conversation, we shared many of the same excitements as well as frustrations and stresses, and it’s helpful to know we’re not in this alone. After a wonderful dessert (and of course a tour of their kitchen) it was time to head back to Alleghany. Each year this is a nice break during the busy week of preparing for our staff to arrive, and it provides a shot in the arm just before all the fun of camp begins. 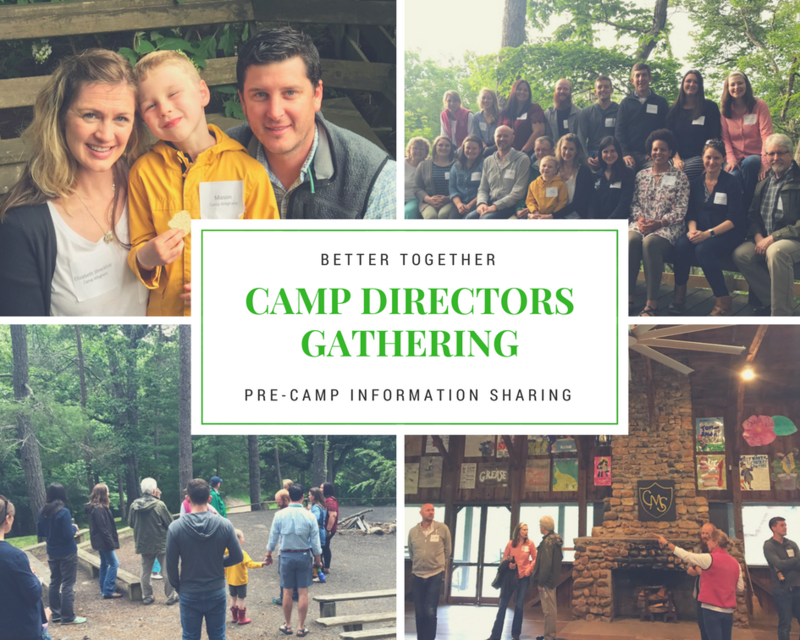 Now that camp is in full swing, I’m so glad that we had this pre-camp opportunity to connect with our fellow camp professionals and gear up for the season together. But now that I’m deeply ensconced in Mini Camp, good-bye until next week when we’ll have a Mini Camp update. Until then, keep on camping!